1 Frogs belong to a group of animals called amphibians. Their name comes from a word that means "double life." That's because most amphibians live part of their life in water and part of their life on land. They have backbones. Amphibians are called cold-blooded animals. That means their body temperature changes when the temperature around them changes. 2 Frogs have smooth, moist skin. They have two webbed feet on their back legs to help them swim better. Most frogs are fast swimmers. Their back legs are much longer than their front legs. They use them to leap. Their back legs have much bigger muscles than the front legs do. 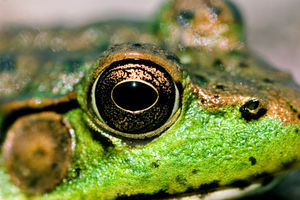 3 If you look closely at the side of a frog's head, you will see a small circle behind the eye. This is the tympanic membrane. It is like our eardrum. Frogs have their eardrums on the surface of their skin. They have very good hearing. Frogs have bulging eyes. They can see in front, to the sides, and partly behind them.